Everything you need create a personal fairy garden of your own! 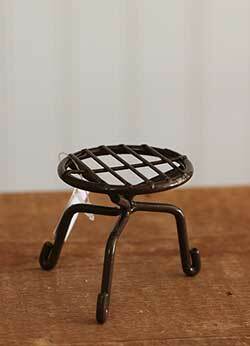 We have miniature furniture, gnomes, fairy houses, fairy doors, mini decor, and more. Great project to do with the kids this spring or summer! 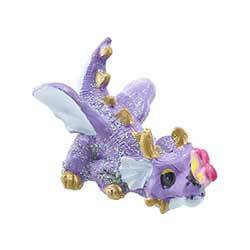 Add a magical touch to a house plant, curio, windowsill, office desk, or fairy garden with this miniature baby dragon! 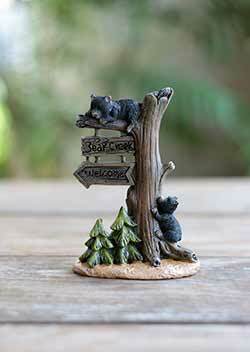 Great for a rustic fairy garden or lodge decor, this tiny welcome sign is accented with a pair of darling black bears and evergreen trees, and reads: "Bear creek welcome." 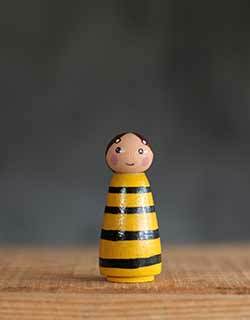 Perfect decor for spring or a fairy garden, this sweet bee girl doll is hand painted in yellow and black stripes, with antennae and wings. 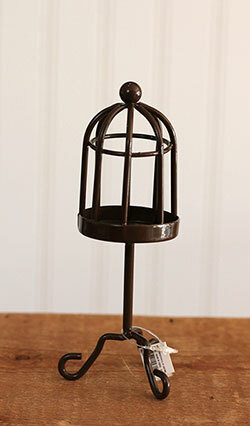 Birdcage Figurine, by Ganz. 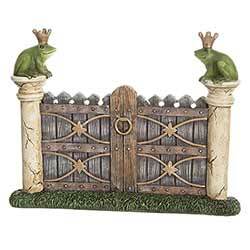 Perfect accent for your fairy garden! Measures approx 2 x 5.25 inches. Made of metal. 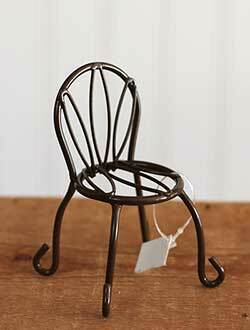 Chair Figurine, by Ganz. Perfect accent for your fairy garden! Measures approx 1.75 x 2 x 3 inches. Made of metal. 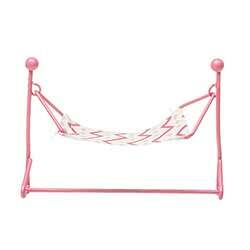 Give your fairies a place to lounge during the heat of summer with this tiny hammock figurine! 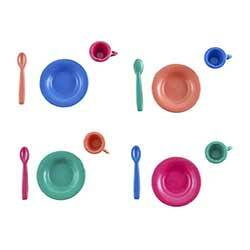 Set of festive table for four with this colorful place settings set! Includes 12 pieces total. Has a white picket fence and a pink door. Measures 6.63 x 5.88 x 4.75 inches. 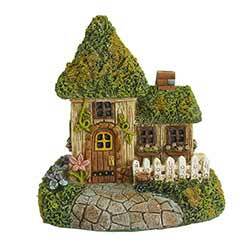 Pair this quaint, mossy cottage with other miniature houses to create a tiny cozy village, perfect for a fairy garden or diorama display! Fairy Door Figure, by Grasslands Road. 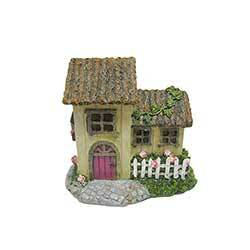 Perfect accent for your fairy garden! Sold individually - Choose the Dewdrop Inn door on the left, or the Ring This Bell door on the right. Measurements: Dewdrop door is 7.5 x 6.5 x 3.25 inches; Bell door: 7 x 6 x 2 inches. Made of metal, acrylic, and cement. 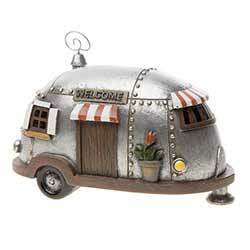 For fairies on the go, this silver camper has red and white striped awnings, a flower pot, and welcome sign. 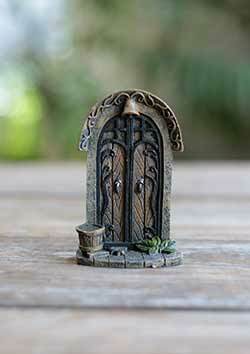 Dress up your fairy garden miniature display with this rustic yet ornate fairy garden door, accented with a bucket and greenery sprig. 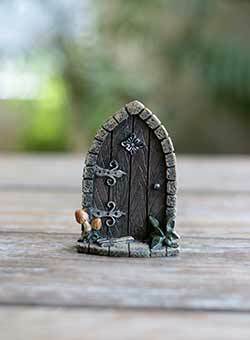 Dress up your fairy garden miniature display with this rustic fairy garden door, accented with tiny mushrooms. 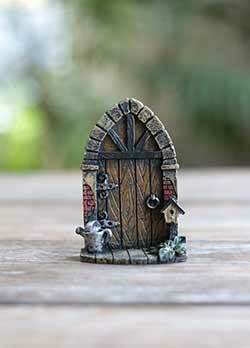 Dress up your fairy garden miniature display with this rustic fairy garden door, accented with a tiny watering can and birdhouse. 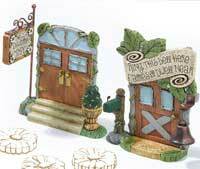 Add a path or walkway up to the door of your fairy garden house with this set of 6 fairy garden stone steps! 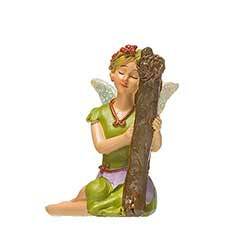 Decorate your fairy garden with a touch of fantasy with this miniature tree figurine with open grinning smile! 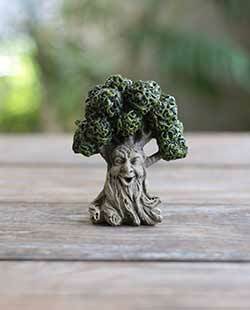 Decorate your fairy garden with a touch of fantasy with this miniature smiling tree figurine! Fairy Garden Trellis, by Ganz. 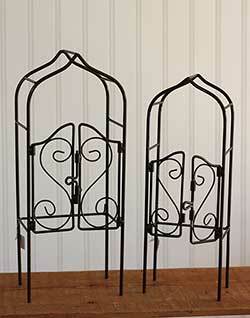 Decorate your fairy garden with this metal trellis! No fairy garden is complete without an actual fairy! This sweet pixie is playing a harp and has glittered wings. 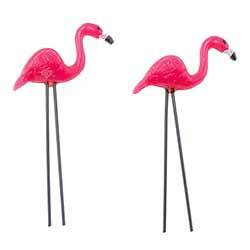 Give a kitschy homey touch to your dollhouse or fairy garden with this set of pink flamingos. Can also use as party favors or funny office gag! 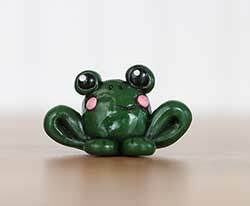 Frog Figure with Pink Cheeks, handmade in Washington State! This sweet frog is a dark green, with rosy pink cheeks! Individually hand sculpted from polymer clay, painted with high quality acrylic paint, and sealed with satin varnish. 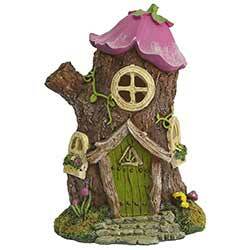 This fairy garden door has a wood look, with swirls and touches of pink, with a crown at the top. 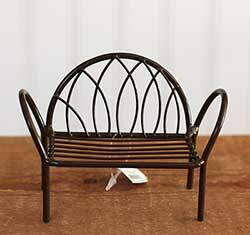 Give your fairies a place to rest with this leafy rocker, perfect for your miniature garden display! 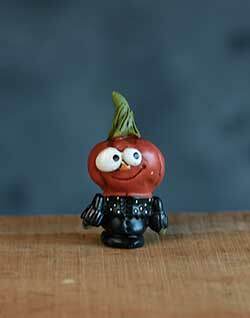 Halloween Miniature, by Enesco. This is for the tiny bat. Figures measure on average 1.5 inches. Halloween Miniature, by Enesco. This is for the tiny ghost. Halloween Miniature, by Enesco. This is for the tiny pumpkin man. Halloween Miniature, by Enesco. This is for the tiny skeleton with green jacket, and black candle. Halloween Miniature, by Enesco. 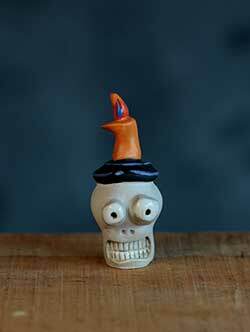 This is for the tiny skull with orange candle. 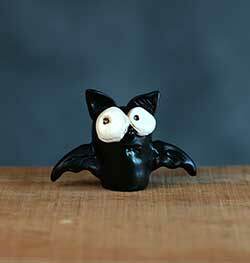 Halloween Miniature, by Enesco. 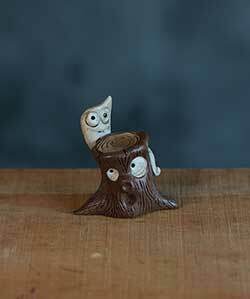 This is for the tiny little tree trunk with wee ghost. 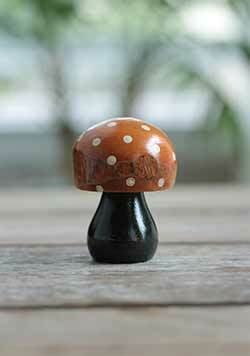 Finish off a fall or halloween display with this whimsical yet rustic wooden mushroom! 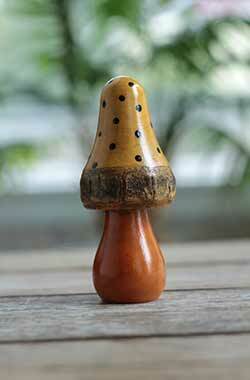 The toadstool cap is muted pumpkin orange with cream colored polka dots, and the base is black. Perfect decor for spring or a fairy garden, this little miss ladybug girl doll is hand painted in black and red polka dots. 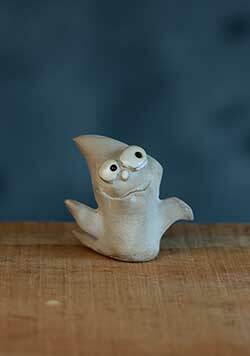 Great for seasonal shelf or mantel decor, an ornament, or as a cake topper! Finish off a fall or halloween display with this whimsical yet rustic wooden mushroom! The toadstool cap is muted muted mustard yellow with black polka dots, and the base is pumpkin orange. 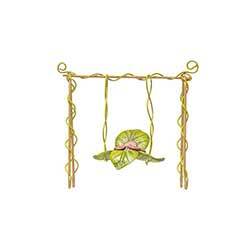 Give your fairies a place to frolic with this leafy swing, perfect for your miniature garden display! This spring-inspired fairy house features a pink flower roof, green door, various flowers and mushrooms, all set in a tree stump. Lights up! Every fairy couple needs a cozy bunch to snuggle on while enjoying the view of their magical fairy home! 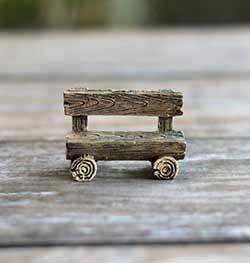 Mini Bench Figurine, by Ganz. 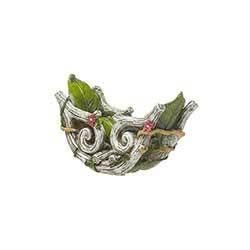 Perfect accent for your fairy garden! Measures approx 3.5 x 3 inches. Made of metal. 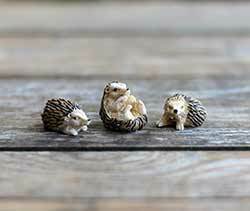 No fairy garden is complete without a few frolicking woodland animals, and this trio of roly poly hedgehogs is about as cute as it gets! 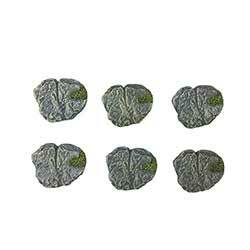 Also great for a curio cabinet, dollhouse display, or garden window. 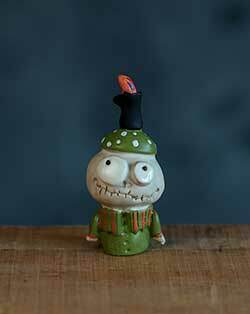 Mini Mushroom, by Enesco / Department 56. 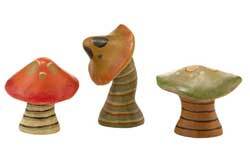 Sold individually from the three designs shown - choose the Left, Middle, or Right Mushroom. 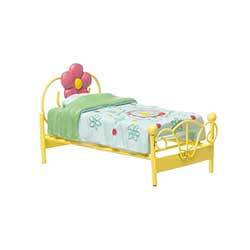 Measures approx 1.73in H x 1.18in W x 0.87in L. Measures A Janelle Berryman design. Part of her Pumpkinseeds Collection for 2013. Made of resin. Other items in collection also available! Mini Table Figurine, by Ganz. Perfect accent for your fairy garden! Measures approx 2 x 1.5 inches. Made of metal. This tiny pixie wears a pink flower skirt, a green shirt, and has yellow wings. Perfect for building your own tiny village, this quaint little stone cottage is accented with a blue door and windows, and ivy.